3. Visit attractions in America and Canada. Summer Schedule: (apply when Lake Ontario cruise resume.) In the morning, guests will continue sightseeing in the Niagara Falls. We will cross the border to Canada through the Rainbow Bridge. You will also watch a dramatic 45-minute IMAX film which will further discover the culture and history of the Niagara Fall! Later, take the ride to the top of the Skylon Tower which is 775 feet above the falls! Relax and enjoy your meal at the 360 degree Revolving Dining Room. 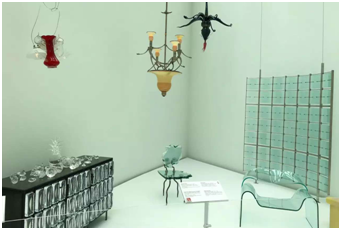 After lunch, guests will arrive in Toronto - the largest city and financial center of Canada - in the afternoon. 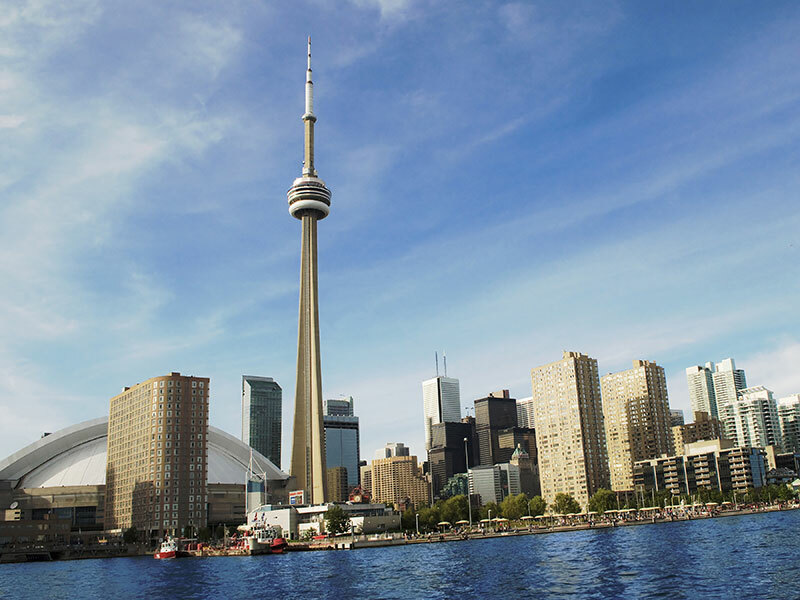 The CN Tower will be the first stop here for fabulous views of the city and Lake Ontario. It is Toronto’s famous landmark, the tallest freestanding structure in Canada, and also the most impossible to miss in our trip. The highest viewing area on the CN Tower is from the Sky Pod at 447 meters and a lower viewing area, the Glass Floor, offers a bird's eye view straight down over the city as visitors stand on a glass floor as the name suggests. We will also see the Ontario’s Provincial Parliament which completed in a Romanesque style in 1893 and then the modernist styled City Hall which consists of two arc-shaped high-rise blocks, 20 and 27 stories high respectively, whose stunning structure makes it another popular landmark. Next, Lake Ontario cruise offers gorgeous views of the city and vicinity from the waters. See the city of Toronto and vicinity in a new way! Around the evening, we will go to the historical Chinatown. It is one of the largest Chinatowns in North America, located in downtown Toronto, where you will find authentic Chinese food! If time allows, we will additionally visit Ripley's Aquarium of Canada. Winter Schedule: (apply when Lake Ontario cruise close.) In the morning, guests will continue sightseeing in the Niagara Falls. We will cross the border to Canada through the Rainbow Bridge. You will also watch “Niagara: Legends of Adventure”, a dramatic 45-minute IMAX film which will further discover the culture and history of the Niagara Falls! 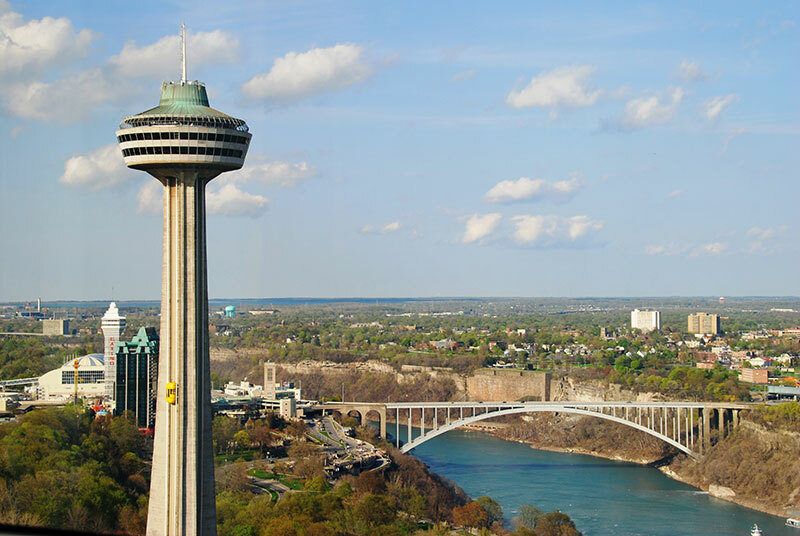 Take the ride to the top of the Skylon Tower which is 775 feet above the falls! Relax and enjoy your meal at the 360 degree Revolving Dining Room. Around the corner of CN Tower is the Ripley’s Aquarium of Canada. It holds over 16,000 fantastic aquatic animals, featuring with North America’s longest underwater viewing tunnel (96 meters) which allow you to walk by the Sharks, Rough tail Stingrays, and dangerous lagoon. Guests will be both entertained and inspired to protect the waters of the world. We will also see the Ontario’s Provincial Parliament which completed in a Romanesque style in 1893 and then the modernist styled City Hall which consists of two arc-shaped high-rise blocks, 20 and 27 stories high respectively, whose stunning structure makes it another popular landmark. Furthermore, experience the elegance and splendor of the Edwardian era at Casa Loma, the only full sized castle in North America and Toronto’s premier historic attraction. Explore secret passageways, elaborately decorated rooms with authentic period furnishings or take in the breathtaking view of Toronto from one of the towers. Then we will go to the historical Chinatown to have dinner. It is one of the largest Chinatowns in North America, located in downtown Toronto, where you will find authentic Chinese food! Summer Schedule: (apply when Thousand Island cruise resume.) In the morning, guests will enjoy the beauty of Thousand Islands on a cruise boat. As the name indicated, the Thousand Islands constitute an archipelago of 1,864 islands that straddles the Canada-U.S. border in the Saint Lawrence River as it emerges from the northeast corner of Lake Ontario. We will be driving on Highway 401 along St. Lawrence River and reach Canada’s Capital and political center, Ottawa. Here we will visit the National War Memorial, Parliament buildings and Peace Tower with the height of 295 feet. Canada’s Parliament buildings are commonly viewed as the one of the most magnificent government centers in the world with firm stone exterior and vivid setting on the cliffs! The buildings consist of the House of Commons, the Library of Parliament, the Hall of Honor, the Senate, and the impressive Peace Tower. After a short stay, we will drive to the Montreal, known as “Paris of North America”, a French-speaking and second largest city of Canada. The famous Olympic Tower together with the Olympics stadium has become the symbol of the city. The 175-meter inclined tower leans at a 45-degree angle and functions as an observation deck with a funicular that whisks passengers to the top in 95 seconds. Amble around and soak up the European charm of the Old Montreal, you will marvel at how you can step back in time at every cobblestone corner. Along the way, we will pass by the grand Notre-Dame Basilica. Lastly, a plenty of dinner options in Chinatown will bring you a satisfactory end of the day! Winter Schedule: (apply when Thousand Island cruise close.) We will reach Canada’s Capital and political center, Ottawa. Here we will visit the National War Memorial, Parliament buildings and Peace Tower with the height of 295 feet. 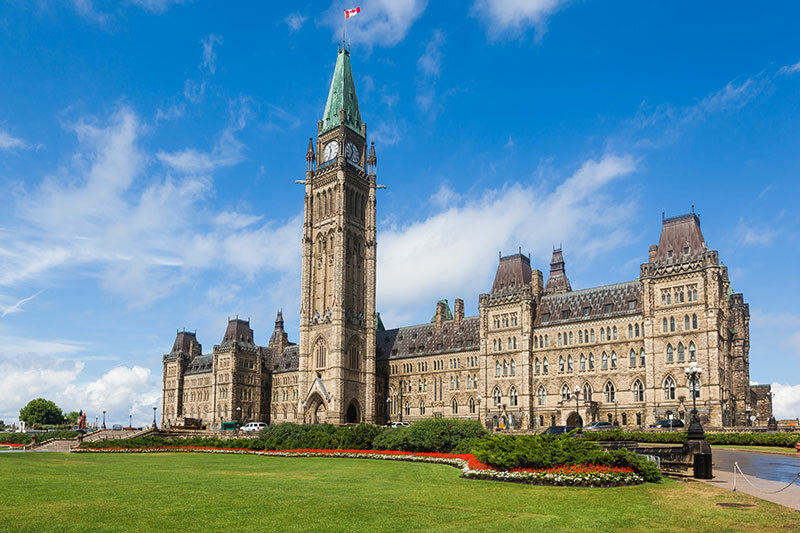 Canada’s Parliament buildings are commonly viewed as the one of the most magnificent government centers in the world with firm stone exterior and vivid setting on the cliffs! The buildings consist of the House of Commons, the Library of Parliament, the Hall of Honor, the Senate, and the impressive Peace Tower. After a short stay, we will drive to the Montreal, known as “Paris of North America”, a French-speaking and second largest city of Canada. The famous Olympic Tower together with the Olympics stadium has become the symbol of the city. The 175-meter inclined tower leans at a 45-degree angle and functions as an observation deck with a funicular that whisks passengers to the top in 95 seconds. Amble around and soak up the European charm of the Old Montreal, you will marvel at how you can step back in time at every cobblestone corner. Along the way, we will pass by the grand Notre-Dame Basilica. Lastly, a plenty of dinner options in Chinatown will bring you a satisfactory end of the day! The first stop will be the Harvard University at Cambridge, MA. 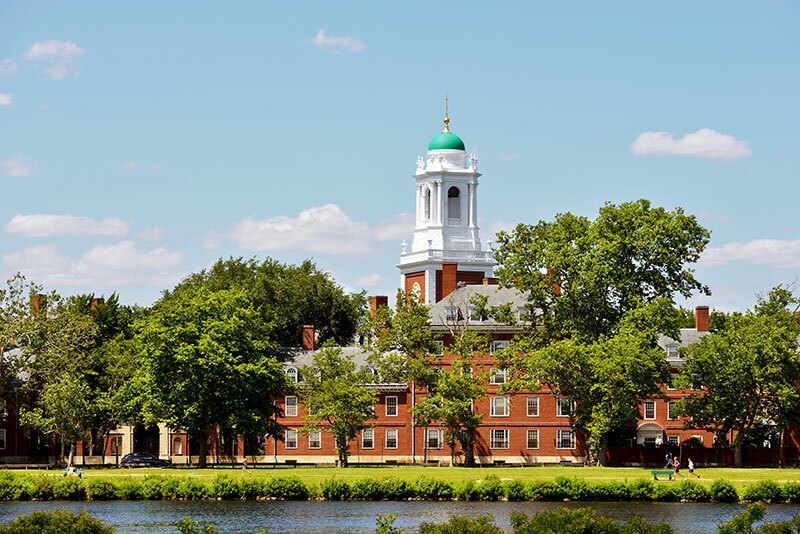 Here, guests will be invited to visit its oldest campus district and take pictures with the Statue of Three Lies - Harvard Statue. Also, we have a chance to walk around the campus of Massachusetts Institute of Technology (MIT) and take pictures with its main building. Later, go sightseeing in the Boston city. We will pass by the old Trinity Cathedral, the Hancock Building, the Boston Park, Prudential Center, and Boston Public Library along the way while overlooking the gold dome of the State House. Another fun will begin as soon as you board the cruise ship and enjoy a breathtaking view of the Boston harbor. Furthermore, the old Quincy Market is opportune for strolling through, or to get a taste of the historical ambience as well as to pick out souvenirs among the assorted merchants and artisans. The Market was also surrounded by dozens of restaurants for dining option with a variety of authentic cuisines, and absolutely, you cannot miss the famous New England clam chowder. The trip will be completed at the Quincy Market around noon. Later guests will be sent to airports in Boston or in New York.